This 18 1\/4 oz. 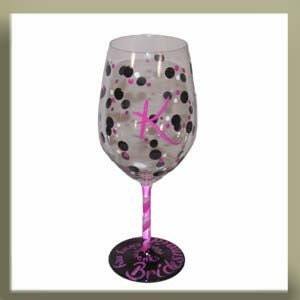 handpainted wine glass is shown in our most popular color combination - Hot Pink, Black and white can be painted in any color combination with any initial. 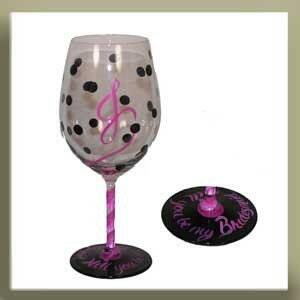 The thing that sets this monogrammed glass apart is that we put any message you like on the base. This one says "Thanks for being my bridesmaid. Some of the other popular inscriptions are "Thanks for being my Maid\/Matron of Honor" "Will you be my Bridesmaid\/Maid\/Matron of Honor?" "Drink Up!" "Mother of the Bride" "Sisters, Forever and Always" "Wine Time"
Just let us know what you'd like yours to say.